04 May, 2008 We would like to appreciate that the present non-political Care Taker Government of the People’s Republic of Bangladesh recently formulated Community Radio Installation, Broadcast and Operation Policy – 2008 and then asked for applications from interested initiators to install Community Radio in the country. In order to facilitate the application and registration process of the organizations for Community Radio, Bangladesh NGOs Network for Radio and Communication (BNNRC) immediately opened a national help desk in its secretariat in Dhaka. As a result, BNNRC is receiving huge response from the interested development organizations for technical support in this regard. 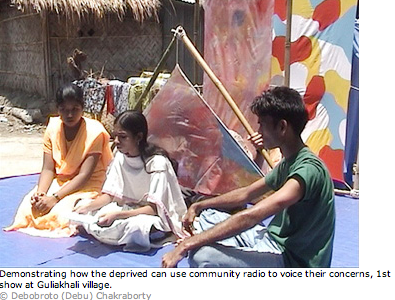 To accelerate the Community Radio Policy 2008, we are going to organize a national seminar on Peoples Voices, Peoples Participation and Community Radio at 09:30 AM -5:00 PM on Sunday, 04 May, 2008 at UNB Auditorium (7th Floor), Cosmos Centre, 69/1, New Circular Road, Malibagh, Dhaka-1212.where resource persons from Singapore, Sri Lanka, Nepal and Bangladesh will present their respective papers. The seminar is jointly organized by Asian Media Information Communication Center(AMIC), United News of Bangladesh (UNB) and Bangladesh NGOs Network for Radio and Communication (BNNRC). Taking this opportunity, we would like to brief about Asian Media Information Communication Centre (AMIC). AMIC is a charity-registered organization established in 1971 with the support of the Government of Singapore and Friedrich-Ebert-Stiftung (FES) of Germany. It aims to spearhead the development of media and communication expertise in the Asia-Pacific to foster socio-economic progress in the region. Its mission is to nurture and promote Media and Communication research, capacity building, knowledge management and dialogue among academia, industry, government and civil society. www.amic.org.sg For nearly two decades United News of Bangladesh (UNB) a private sector news agency, has recognized the supreme importance of quality and objectivity in reporting and disseminating information. UNB is recognized as the nation's most dependable and credible source of news and information, serving some 20 million readers, listeners and viewers in Bangladesh everyday. UNB's sophisticated communications system process the equivalent of a quarter million words a day gathered from its own network of correspondents and the dispatches from its international partners. www.cosmosgroup.net , www.unbnews.org Bangladesh NGOs Network for Radio and Communication (BNNRC) is a national networking body working for building a democratic society based on the principles of free flow of information, equitable and affordable access to Information & Communication Technology for Development (ICT4D) of remote and marginalized population.